You've thought long and hard about getting one. You've spoken to attorneys that charge between $3,000 and $5,000 for an uncontested divorce, only to put it off yet again. It doesn't need to be expensive, stressful, or difficult. By the People in Riverhead can help you out of the doldrums for a fee as little as $450.00, plus the required county clerk and court fees. Take the first step to start a new life. 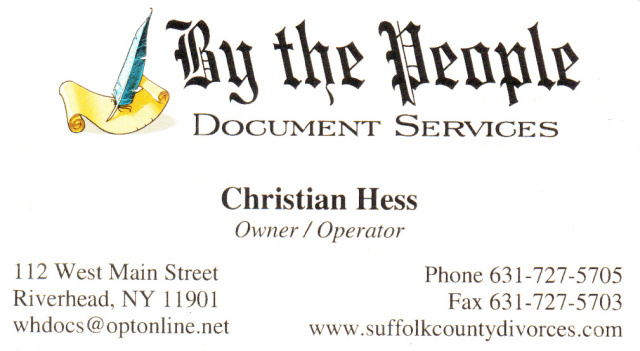 Call Christian at 631.727.5705, or click on www.suffolkcountydivorces.com, and begin resting easy once again.